The top included in the new Lisette B6183 pattern for Butterick is a grown-up T-shirt. 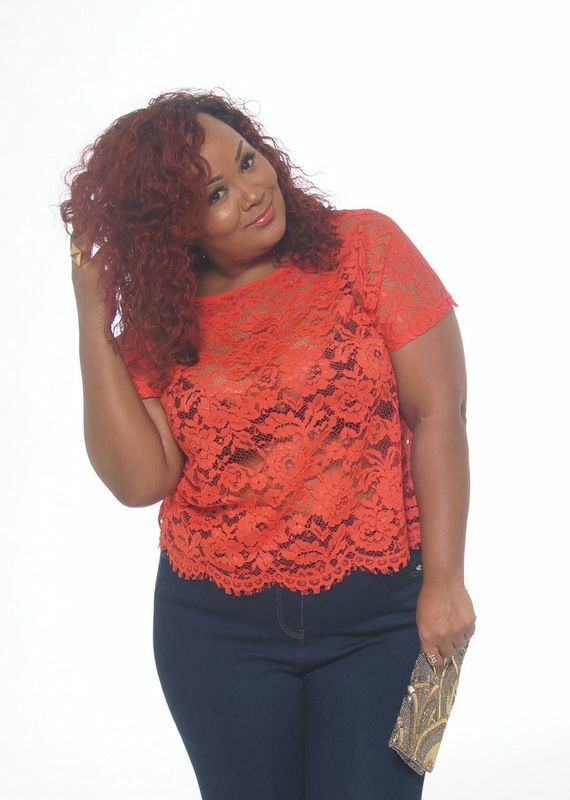 It’s designed for woven fabrics and is a little more fitted than a basic T. So it’s flattering instead of floppy. It works well both worn alone and as a layering piece, so if you wear a suit to work it will be a great basic under jackets and worn with accessories. But it also looks great worn by itself with skirts, trousers, and even jeans. You’re sure to get a lot of wear out of it. 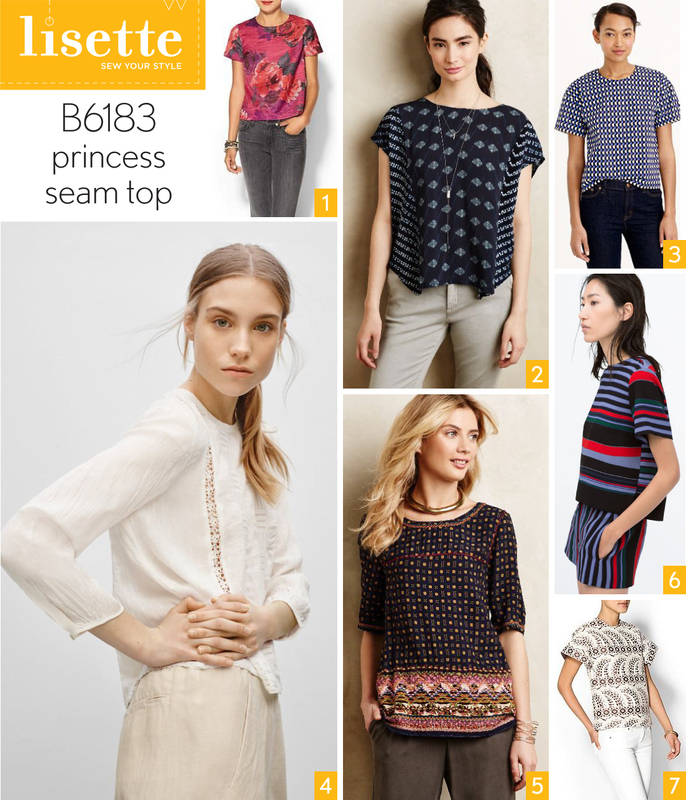 This pattern has princess seams, which are so helpful for getting a good fit. And I already mentioned that the pattern comes in multiple cup sizes, so the first step in getting a good fit has already been done for you. Ready for a few fabric and styling ideas? This style was a lot of fun to research for you! Isn’t this floral print pretty? Pick a dressy floral with your favorite colors and you’ll be surprised how often you can wear this. The shape of this top is quite different from the top in the pattern, but I included it because I like the color blocking with two different prints. As long as the prints are a similar color palette and different scales this can be a really fun way to play with two prints you like. If you want to achieve a slimmer silhouette you might try using darker side panels, which can give the illusion of a narrow waist. 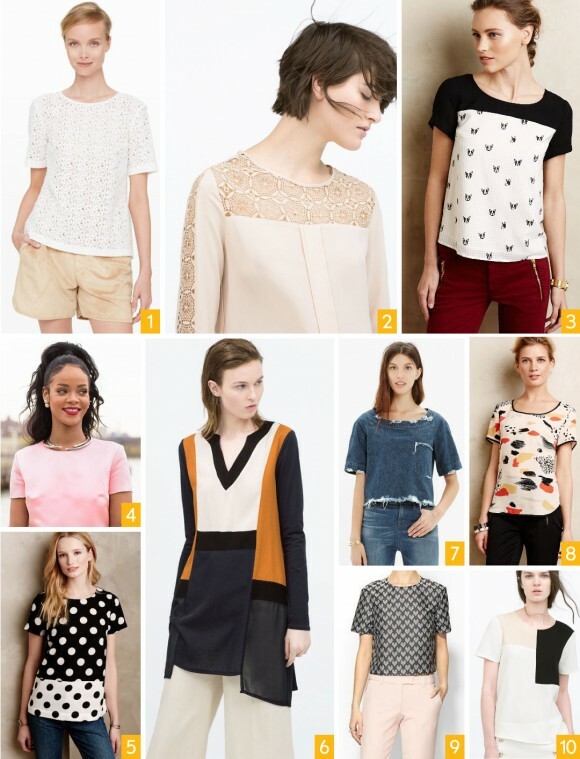 Try a geometric print or an interesting jacquard for a fancy version of the top. Princess seams are a great place to try insertion lace, which is an heirloom technique that’s incredibly easy to sew. 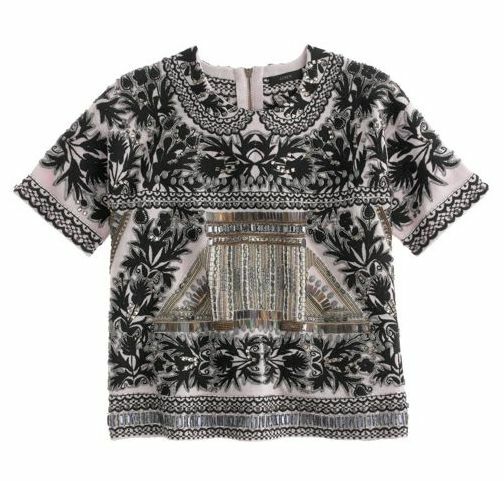 Try an Indian block print for a boho look! An awning stripe will give a really contemporary look that would be fun for spring or summer. Look for pretty, simple prints like this one. Lace, of course. Don’t miss this version or this version in the Lisette Pinterest board either. Color blocking the yoke and sleeves for a sporty look. Here’s another contrast yoke you might like. Reverse polka dots would be a fun way to color block this pattern! Again, do the yoke and sleeves for a really cute top. Speaking of color blocking, go all the way with three bold solid colors if you really want to have fun with this style. Black yoke and sleeves, mustard side panels, cream center front and center back panels. and maybe a black band at the hem, just for fun? This style doesn’t have to be fancy. Denim or chambray would make a great casual style, and I love the raw edges for a tough look. If you’re not a fan of raw edges, try flat-felled seams. Neutral jacquard. Or use a tie silk for a really fancy and colorful top! And if you’re really feeling adventurous, look for a fabric with a lot of texture, like this one. Neutral color blocking. Very sophisticated and versatile. You could cut the yoke in half for a similar look. I couldn’t leave without featuring a few more versions I love. This crazy-fancy embellished wool version is just so pretty. You might be inspired by some of these over-the-top details to try embellishing in a smaller way yourself. A little trim on the sleeves, perhaps? A fancy embellished collar, either applied or simply embroidered? Maybe some beading along the edge of the yoke? And if you have an embroidery machine, certainly an embroidered yoke! See what I mean about being a great style for fancy? This is actually a dress, but I prefer it as two separates. And we have a great Liesl + Co. skirt pattern coming out soon that would be perfect with this top to create a similar style. Stay tuned! As always, there are many more ideas on my Lisette board if you need more inspiration. I’ll show you the fabrics I’ve selected for this top soon. Who wants a sew-along for this style? I would love a sew along. I am trying to sew more for myself. I’ve made this one once…too big. Adjusted the pattern and made it again….love it! And, can’t wait to have time to make it again. The pattern is a lovely sew and lovely to wear! Thanks for that! I like the last photo you put up. I was thinking of doing the same sort of outfit with some cotton suiting and a pencil skirt for a professional “suit” fit for my warm climate. I was wavering, but now I think I’ll go for it! I just made the pants, and they fit perfectly with no adjustment! They came up to just under my navel, which is higher than I expected. Is that where they are supposed to hit? Can’t wait to try the shirt. 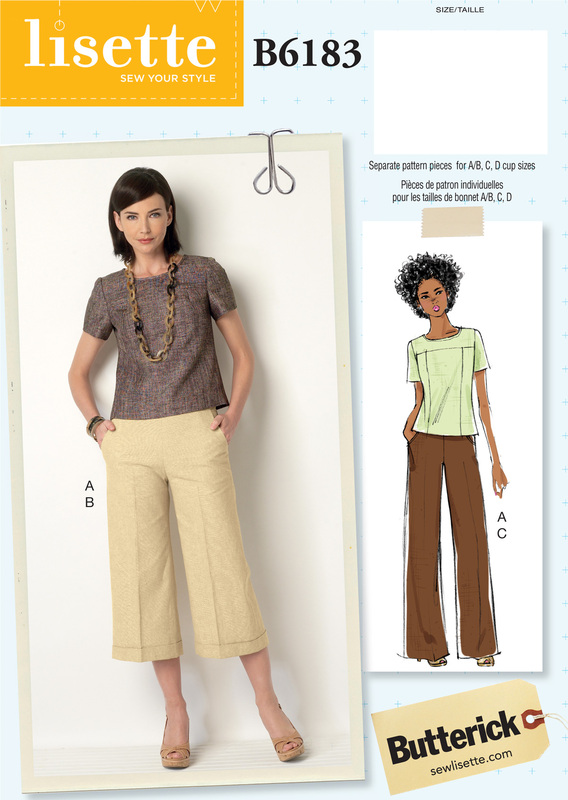 Yes, the pants have a higher rise because the waist is gradually returning to where it traditionally has been. For the past 20 years our waistlines have been much lower than our actual waists! I’m still adjusting to the look and feel. Right now I’m wearing trouser that hit at my navel and it still feels weird! For you too? I think we’ll adjust. Love your inspiration ideas! And good to know about the pants. I made a muslin and they were just under my navel too. I just made the top in a linen/rayon blend. I didn’t have to make any adjustments and love the fit. I have a more petite build and the shape is flattering with just the right amount of ease. Reading these comments, I’m now considering making the pants! I’m glad to hear waistlines are creeping back up. I feel like there’s a flattering middle ground between low-rise and the very high-waisted items I’ve seen in stores lately. I am excited to see the lace and lace inset versions. I adore lace but have never tried to sew with it. The color blocking variations are fun too. Yes, for a sew along!